The Department of Fisheries and Oceans (DFO), The University of Guelph (UofG), Parks Canada, Canadian Hydrographic Service, Geological Survey of Canada and the Chippewas of Nawash Unceded First Nation have a joint interest in developing a unified approach to shortjaw cisco research and management options in support of conservation of this species. Deepwater cisco are an important part of First Nations fisheries on Lake Huron, and much remains to be learned about their distribution, life history and habitat requirements for effective conservation and management plans. Currently, the Minister of the Environment is recommending that the assessment for shortjaw cisco be returned to COSEWIC for further information or consideration (CSAR 2005. p4042). The goal of our research is to develop and implement a formal decision analysis tool to reduce uncertainty in the application of quantitative assessment criteria employed by COSEWIC to assess and determine species designations. We will address three uncertainties that currently limit our ability to make informed decisions regarding status, and the potential listing of shortjaw cisco. 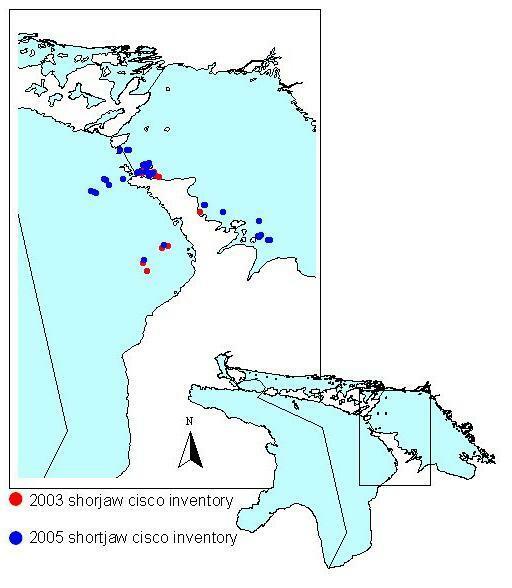 First, we will undertake a population assessment of shortjaw cisco to reduce uncertainty of its life history, distribution and abundance in Lake Huron. Second, we will formalize all existing evidence into explicit terms, including expert opinion, as to whether clear speciation and definition of designatable unit have been applied to shortjaw, which can then be included in a formal decision making process. Third, we will demonstrate how uncertainty associated with determining population-level quantitative assessment criteria can be explicitly incorporated in the decision making process for designating species status. This research will provide a quantitative decision tool that makes use of best available information through retrospective analysis and reduces key uncertainties through planned field studies. Deepwater cisco species are an integral component of the Fathom Five ecosystem and are an important part of First Nations fisheries on Lake Huron. Historically, there were as many as eight species of deepwater ciscoes in the Great Lakes, several species are now considered extinct and all of the extant species are extirpated in one or more of the Great Lakes. The shortjaw cisco is considered Threatened by the COSEWIC and is currently being considered for listing under the SARA. The goal of this research is to understand the life history characteristics and the biophysical attributes of habitat required by adult life stages of the shortjaw cisco with a specific focus on identifying “critical habitat” for the species. This research combines shortjaw cisco inventories with lake bed (habitat) mapping in Fathom Five Marine Park in an effort to confirm hypotheses about habitat associations and identify critical habitat.